MAPPING of local natural resources by the villagers is an experiment being tried out by three Kerala organisations: the Kerala Sastra Sahitya Parishad (KSSP), the Centre for Earth Science Studies (CESS) and the Kerala State Land Use Board (KSLUB). Economic growth is unsustainable unless the exploitation of natural resources is within the limit of the carrying capacity of life support systems. Achieving development that is sustainable and environment-friendly needs decentralised, micro- level approaches. This requires scientific data based on local resource endowments. An integrated programme of panchayat level resource mapping was started for the first time in the country with the scientific evaluation of the terrain in Ulloor panchayat of Thiruvananthapuram district in Kerala in 1990. The endeavour involved the local community, training them in the art of resource mapping which involves a high level of scientific skills. The training module, developed by CESS, includes three days of theoretical deliberations followed by five days of field demonstration and mapping work. Course material has been designed to include a brief exposition on the development crisis in Kerala, the need for micro-level surveys, and the relevance of resource maps and mapping procedures in detail. A comprehensive legend has to be worked out by the participants. Water-related data are gathered in a structured format. Plot-wise details covering land-use, settlement details and water availability and problems are recorded in a diary. At least five persons from each ward of a panchayat participate in this work. After the theoretical deliberations, field demonstrations start. Scientific and technical personnel initiate the volunteers in the use of cadastral maps, as the local people can easily identify these plots. The experts are fully involved in the mapping exercise on the first day. They themselves map, write diaries and fill up the water chart. By the second half of the day, volunteers are asked to conduct the survey with the assistance of scientists. Volunteers undertake the major work on the second day. Scientific staff oversee their work and provide assistance if required. Volunteers start mapping on their own from the third day. At the end of the day, the entire team discusses the survey to sort out problems. An important component of the mapping programme is systematic campaigning. Preceding the mapping, volunteers participate in kala jathas (cultural programmes) and meetings and make door-to-door visits to spread the message of the programme and solicit local support. Intensive ward-wise discussions of land use problems are also undertaken. The Ulloor Model, improved by the CESS, KSLUB and KSSP, has been extended by the Indian government's department of science and technology to 23 panchayats in Kerala. The project involves scientific terrain evaluation by earth scientists, the mapping of existing land and natural resources by local volunteers and the preparation of action plans for panchayat- level development based on these maps. The information and maps by digitisation, using the Geographical Information System (GIS) software, is then computerised. 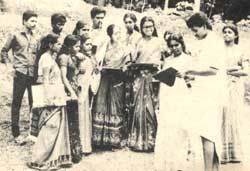 In December 1990, the Kerala government brought all the panchayats in the state under the scheme, with CESS as the nodal agency and KSLUB as a collaborator. Already 30 panchayats have been scientifically evaluated and mapped by local villagers. The total cost of developing resource atlases for the whole state was estimated to be Rs 2.8 crore, of which Rs 1.7 crore can be saved through the involvement of volunteers. The additional money is being provided by the government. The traditional wisdom, values and ethics of the local people, combined with the scientific evaluation of resources, eliminates problems of centralised planning and focusses on grassroot realities. It is perhaps the only alternative to existing resource management models which have led to widespread environmental degradation.